John Ek knives, go as far back as 1941. These were no nonsense knives. Strong, tough and razor sharp! Ek was best known for his Commando knives. They were made from materials, like Venadium, and Poly-Chromium, that was rationed during the war. The government allowed him to make the knives because of his motto, "Made in America, by Americans, for Americans." The only way you could get one of his knives during the war, was to show your military ID card to a dealer. The dealer would then have to turn in the ID numbers for every knife he sold. If the dealer had no ID numbers, he could never get another knife from John Ek again. The Richmond Virginia, knives are becoming quite the collectible. Especially the throwers, because they were only produced in the last year. The oldest ones [high-quality nickel-chromemoly steel] made in the 40's and 50's are the most sought after, and very hard to find. 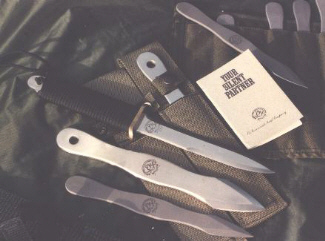 Ek knives were bought out by Blackjack knife company, then in two years Blackjack went belly up. After they crashed and burned, the knives started to show up as Chinese Imports (less the, bead blast finish and Ek logo crest). The large throwing knives are exact copies, but the small, are just a little different (I mean JUST a LITTLE different). In others words the large ones I think, come from the same dies, [or exact copies] the small don't, and I have never seen any other Ek style from China. inches overall, in length. 1/8 inch thick, high carbon stainless steel, Rockwell hardened to C55. compliments of the Ek Co., for an article I wrote. They also made a large thrower, it was 1/4 inch thick made from HSC 1718 high carbon stainless steel, and tempered to Rc 55, these sold for $49.00 each. The Ek Co. is now run by the "old" group of management and makers, (they stayed together even after the buy-out) and a few "insiders", (of which I am not), knew this. have seen the Chinese copies, you just didn't know where that design came from. In my video, Recreational Knife Throwing, the knives that I pull from behind my neck, and under my sleeve, are Ek Throwing Knives.